It was a cold spring evening in Beijing. Simon and I had just arrived at DaDong, the esteemed restaurant chain that I believed could hold the key to the Peking Duck of my dreams. I knew Peking duck in Beijing was a must-have, and I did my research prior to our trip to China. There's the old-school chain, Bianyifang, established in 1416. There's the longstanding stalwart, Quanjude, established in 1864. And then there's DaDong, a relative newcomer from 1985. Simon isn't quite as fascinated by food as I am, and moreover I knew a comprehensive duckfest in Beijing was not easily achievable on our schedule. 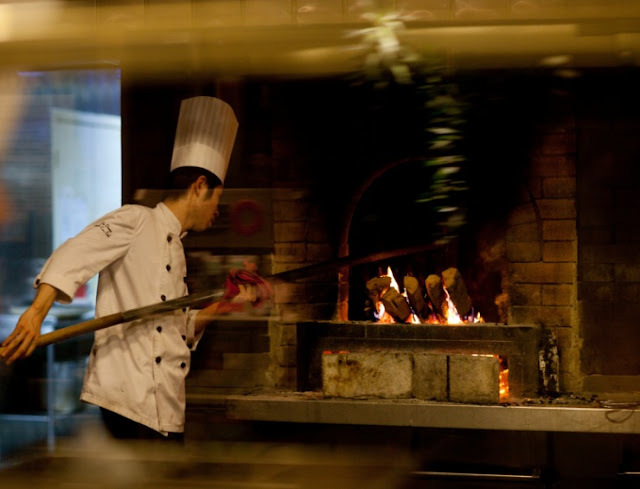 Out of the many Peking duck restaurants in Beijing, I found DaDong to be the most promising. 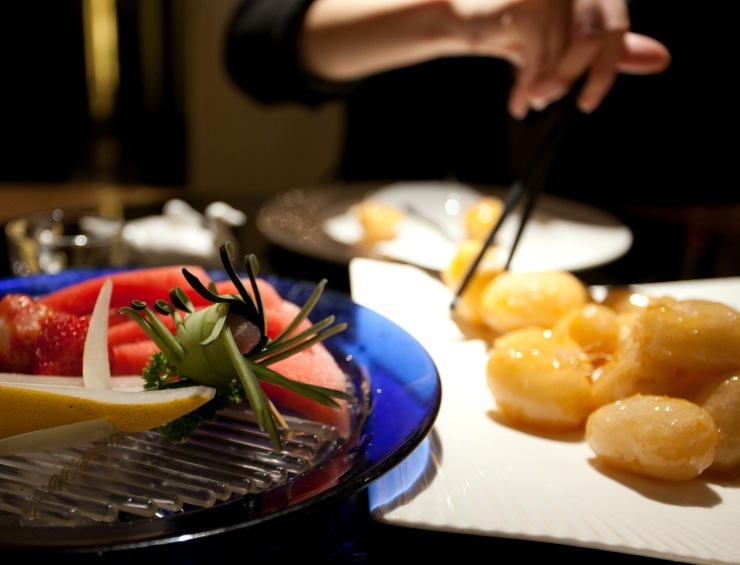 It garnered high scores from the aggregate restaurant review sites in China. 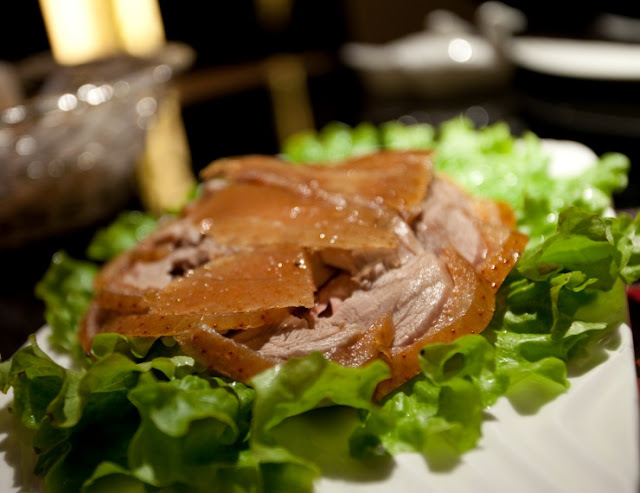 Happy customers cited the roast duck at DaDong to be lighter and crisper than their rivals. Hell, Heston Blumenthal visited DaDong in his quest for the perfect Peking duck. 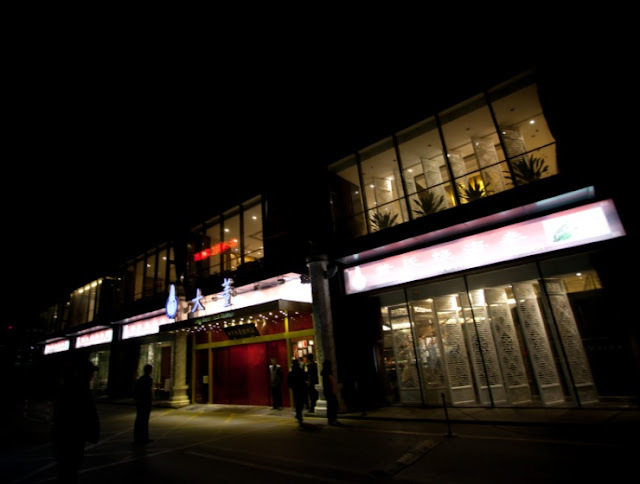 If we could only fit in one restaurant for Peking duck, surely it had to be DaDong. Still, once we landed in Beijing, I decided to pester the locals for their opinions, my curiosity unsatiated. The taxi driver who took us to our hotel from the airport was the most knowledgeable, having had his duck at all the major players on the scene. "DaDong," he responded without hesitation when I posed the question. The roast duck at DaDong had all the flavour with half the grease, he said, and it was the clear winner for him. So that was that. And here we were, finally. We entered the restaurant. It was a Thursday night, and the reception foyer was busy with punters. We had neglected to make reservations, so a girl gave us a number and told us to wait for our turn. We found empty seats and sat down. I gazed into the clear glass that separated us from the kitchen and looked upon the staff going about the preparation of the ducks. Ducks that glistened, mirroring the angry flames rising from the burning firewood. Ducks hanging and resting off stainless steel bars. A man in chef's whites deftly slashed one of the cooked ducks, and the juices came gushing out with reckless abandon. I rummaged in my bag for my little point-and-shoot camera, but the battery was dying. 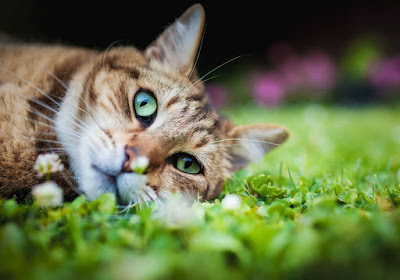 I asked Simon if he could help me out with his DSLR, and he obliged. Disaster averted. We watched and we waited. Twenty minutes later, our number was called. The menu at DaDong was a work of art - I wish I had asked Simon to take photos. It was a large, heavy book, filled with stunningly styled pictures of their extensive options. DaDong, it turned out, wasn't just about the duck. 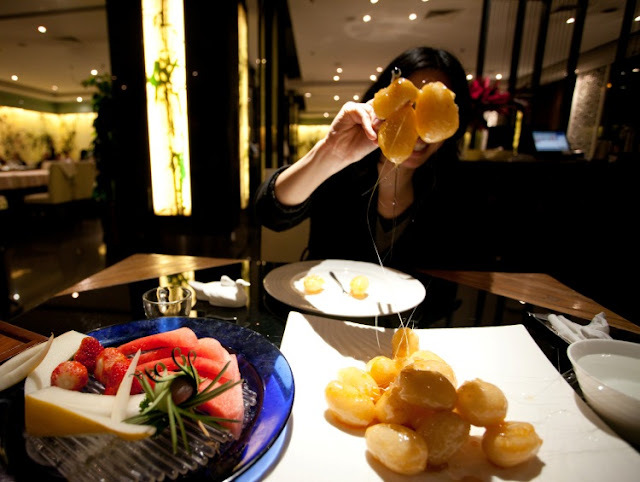 They have a vast range of dishes, ranging from traditional favourites to the modern exhibits of molecular gastronomy. One memorable option was styled in the impression of a winter's scene: a wash of snow-white flecks raining upon elegantly sculpted morsels on slate-gray stone. We bypassed the numerous temptations with some reluctance, and proceeded to order Peking duck, half a bird's worth, and a pot of tea. A chef prepared the duck by our table with nimble precision. Only the top surface area - the skin, along with a slim sliver of the flesh underneath - the crème de la crème, if you will - was sliced onto the plate for us. He then left, taking the rest of the carcass with him, which still had substantial amounts of meat on it. Apparently we could've requested to take the remains home, or, in our case, back to our hotel, but we didn't know it at the time. Roast duck at DaDong. Now that's what I'm talking about. 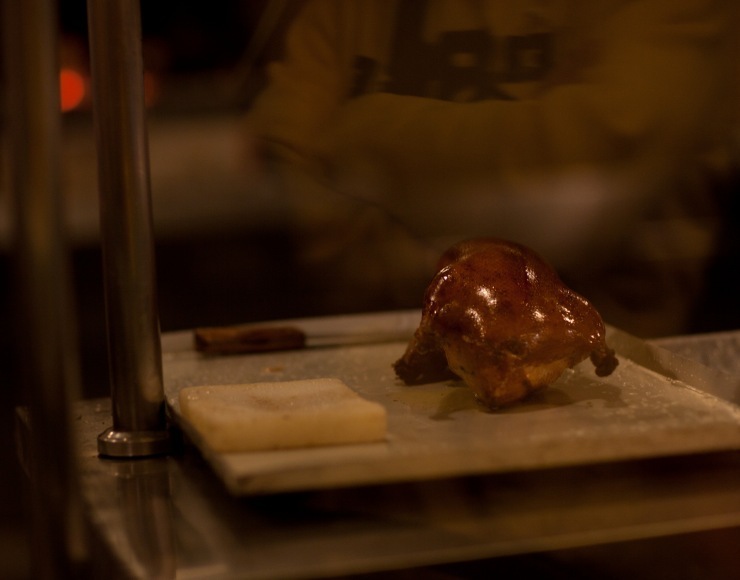 The skin of the duck was delicately crunchy, the flesh gentle and juicy. Gleaming with translucence, it crackled and dissolved in our mouths without the excessive oil slick that all too often comes with the territory. Yes, it was refined. It was magnificent. The duck had two platforms on which to shine: sweet, crisp sesame buns that were scrumptious enough to eat on their own, or the more traditional thin pancakes, ethereal yet not too fragile. Both were superb. 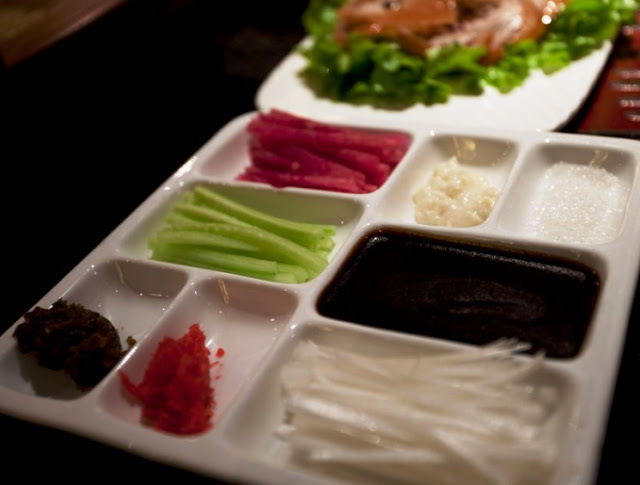 An array of condiments to raise the Peking duck dish to another level of lusciousness. The condiments for dressing the duck were a joyful collage of sweet bean sauce, cucumber, leek, radish, garlic paste, pickled/preserved vegetables, and even white sugar - a surprising inclusion that just made so much sense, in the same glorious way that honey-baked ham and maple-candied bacon makes sense. We finished every crumb on our plates, then pored over the menu again - for dessert, naturally. Digging into the candy apples. Simon and I concurred on the hawthorne sorbet, which we felt would be a refreshing end to the dinner, but it was sold out. We settled for the award-winning deep-fried apple fritters with spun sugar. The waitress brought it to our table, and dunked the apple fritters quickly in and out of a bowl of iced water, solidifying the syrupy exterior into a crunchy coating with slender thread effects. Though we opted for a small serve, it was perhaps still a little too generous for the two of us. Perfectly brittle on the outside, hot and tender on the inside, I popped the first few fritters down with enthusiasm - but make no mistake, this is quite a heavy dessert, and with only some complimentary fresh fruit to lighten it up, we both struggled to finish it by the end. The bill was not too daunting at all. The Australian dollar was strong at the time, and our simple meal came well shy of AUD$20 per person. So was that the best Peking duck in the world? I don't know. But it was certainly the best Peking duck I've ever had. I only regret there wasn't a second visit to DaDong, and I wished, too, that we could've made the time to visit at least one of their rivals on the Peking duck scene. But I am content. When I hark back on this experience - perhaps with the rosy hue of travel nostalgia, yes - it had an almost magical quality to it. It would be greedy to ask for more. Thanks Hannah! It really was a fun and tasty dessert. And the tray of condiments were the best I've ever had for Peking duck. Mmmmmmm. i tried making candied apples once. It was a disaster! I imagine they would be quite tricky! Need to be very quick and nimble. Oh EMM GEE!!! I love love love duck... and I think if I were you, I'd go to each of the 3 to be able to make a good judgement call :P Because you know.. YOU NEED TOO!!!! So jealous! Yes, I think I have to go back to Beijing again to try them all. ;) I find it difficult to imagine a more exquisite Peking duck, but bring it on! DaDong looks amazing ... and I love your phrase 'so crispy it shatters!'. I've never really had a burning desire to visit China (too many other places to get to first) but now I have pretty convincing argument to bump it up the ladder at least a few rungs! :) If you can get hold of Heston Blumenthal's In Search of Perfection - either the TV series or the book - he pays a visit to DaDong and it's very interesting to see how elaborate and scientific their duck-roasting process is. And DaDong (the man himself) flicks the skin on the table to show off how it shatters upon impact. Heston says of it: "It's crispy but it just melts at the same time. I've never had anything quite like it." My mouth is watering as I read this. Peking duck is one of my favourite things of all time and that crispy, glistening skin - wow. Yet another reason I want to go to China! It really was gorgeous. I think I appreciated it even more after the trip when I tried a few places in Melbourne and they just didn't compare. If I ever find myself in Beijing, I'd know where to start from, at least for the duck. Oh yes. This was our only planned meal. The others were spontaneous and with hits and misses. But it's all part of the fun! Wow, that is some seriously good looking food. I'm considering visiting Beijing just to eat here! And it was seriously good! Also, I found Beijing to be a pretty cool place to visit and experience. Heaps of character. It really was a wonderful experience! More so in retrospect as I search in vain for similarly good Peking duck in Melbourne... I think they need to start a branch here. yay! I am so jealous of your trip! What a lovely food adventure. I, too, have a fascination with Peking duck. And watched it being prepared on a recent trip to Beijing. Love a girl that does her food homework before travelling! Lovely post. I remember your post on that! I wasn't that fascinated by Peking duck until I booked my trip to Beijing. And I think it was only then that I realised how good it was. That's it, I'm booking my ticket. As soon as this baby is born we are off adventuring and eating. Great post. What a magnificent meal! I love it when someone says that the meal might not be the best in the world but the best they'd ever eaten. When I read that from a food writer, I listen. Wow. This is such a world away from anything I can imagine, it just seems so luscious. And that amazing-looking restaurant is part of a chain? Crazy. It really was luscious, and indeed, this is no ordinary chain. A lot of care and research has gone into their duck, and from what I know, it's quite a daunting, intricate process! This was a sublime meal, wasn't it? YUMMY! I know duck well. It's kind of a staple in France too, and we have plenty of ways to eat it (even in carpaccio, which is surprising but oh so delicious). They really know how to make you crave duck. Dang it! Oh I miss quality chinese food!